Seventeen-year-old Belle Boyd, an avowed rebel with a dangerous temper, shot a Union soldier in her home and became a courier and spy for the Confederate army, using her considerable charms to seduce men on both sides. Emma Edmonds disguised herself as a man to enlist as a Union private named Frank Thompson, witnessing the bloodiest battles of the war and infiltrating enemy lines, all the while fearing that her past would catch up with her. The beautiful widow Rose O'Neal Greenhow engaged in affairs with powerful Northern politicians, used her young daughter to send information to Southern generals, and sailed abroad to lobby for the Confederacy, a journey that cost her more than she ever imagined. Elizabeth Van Lew, a wealthy Richmond abolitionist, hid behind her proper Southern manners as she orchestrated a far-reaching espionage ring—even placing a former slave inside the Confederate White House—right under the noses of increasingly suspicious rebel detectives. Abbott's pulse-quickening narrative weaves the adventures of these four forgotten daredevils into the tumultuous landscape of a broken America, evoking a secret world that will surprise even the most avid enthusiasts of Civil War–era history. With a cast of real-life characters, including Nathaniel Hawthorne, General Stonewall Jackson, Detective Allan Pinkerton, Abraham and Mary Todd Lincoln, and Emperor Napoléon III, Liar, Temptress, Soldier, Spy shines a dramatic new light on these daring—and, until now, unsung—heroines. Liar, Temptress, Soldier, Spy: Four Women Undercover in the Civil War is the story of four women during the American Civil War. I chose to review this because reading about women's actions during the Civil War was completely intriguing to me. Two of those women are for the Confederate army and two are for the Union army. Belle Boyd is a young rebel determined to make a name for herself by becoming a spy for the Confederate Army. Emma Edmonds enlists in the Union army as Frank Thompson. Rose O'Neale becomes a rebel spy in Union territory, while Elizabeth Van Lew becomes a vital part of the Union spy network while under the watchful and hateful eyes of her rebel neighbors. While this is a work of non-fiction, it reads very much like a work of fiction. One of the reasons is because the story is very much centered on the four main characters rather than being a dry recitation of historical facts. By using journal entries and other sources, Abbott placed dialogue into the novel. The reader really gets an understanding and insight to the four main characters' thoughts and motives, along with those historical figures such as Allan Pinkerton and ordinary people such as the women's neighbors and friends. However, Liar, Temptress, Solider, Spy is still a work of non-fiction, and, at times it felt like it. For one, the book was easy to read, but also easy to put down. I was 3/4 of the way through the book before any sort of suspenseful feelings arose. For another and connected reason, the book never managed to completely engage my emotions. Of the four characters, Elizabeth and Emma were my favorites, and the ones I most liked to read about. Admittedly, this may be because they were Union supporters; therefore, on the "right" side of history, but I also thought that their motivations were more noble than their Confederate counterparts. For the majority of the novel, I never really saw a reason for Belle. All of her antics were for her own gain, rather than helping the war. She was, however, entertaining as she was spunky, brash and acted before thinking. As for Rose, while her methods and actions were respectable and interesting, her ideologies were awful. Elizabeth was the least selfish of the group; she saved a lot of lives and helped a lot of people with much self sacrifice. Emma was probably the most interesting to read about, as a woman hidden undercover in the war. From the women's perspectives and those around them, we receive a very well-rounded account of the Civil War. I was surprised that I loved reading about the battles and war tactics. Also, from using supporters of both the North and South, Abbott was able to show that there were truly deplorable actions on both sides of the war. 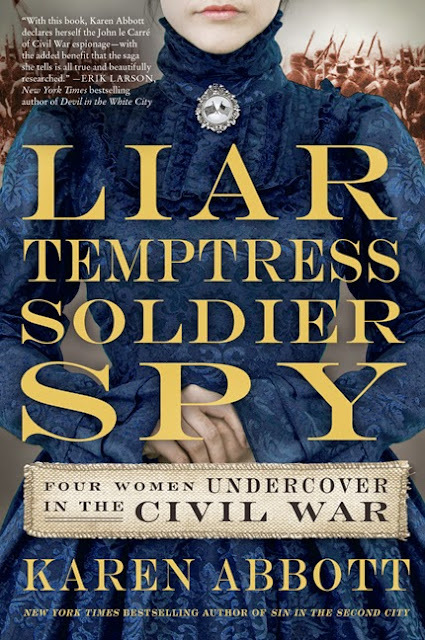 I was surprised by how much I enjoyed Liar, Temptress, Soldier, Spy: Four Women Undercover in the Civil War and how quickly I was able to read it. I'm just not a fan of non-fiction in general; I read enough non-fiction in college and law school and now as an attorney, and I like to use reading as an escape. Abbott is a talented and compelling writer, and I will definitely be reading another of her non-fiction works. As it is, I was researching all kinds of Civil War trivia that I forgot (Abbott covered a lot of ground, but I wanted to know specific details well before she introduced them. Impatience is not a virtue), and now I want to re-read Gone With the Wind and even pick up my mom's copy of North and South. Great review, I think I'll have to put this one on my TBR list ! I do enjoy stories about strong women :) thanks! It's a great story about strong women, especially since this side of the war is not covered as often. I hope you enjoy it when you read it! I so appreciate an author who can make non-fiction read like thoroughly engrossing fiction! Thanks for giving me the opportunity to read the book. It was out of my comfort zone, and I'm glad I took the chance!